Who doesn't like curry chicken with rice? This recipe is slightly different, it's east meets west. 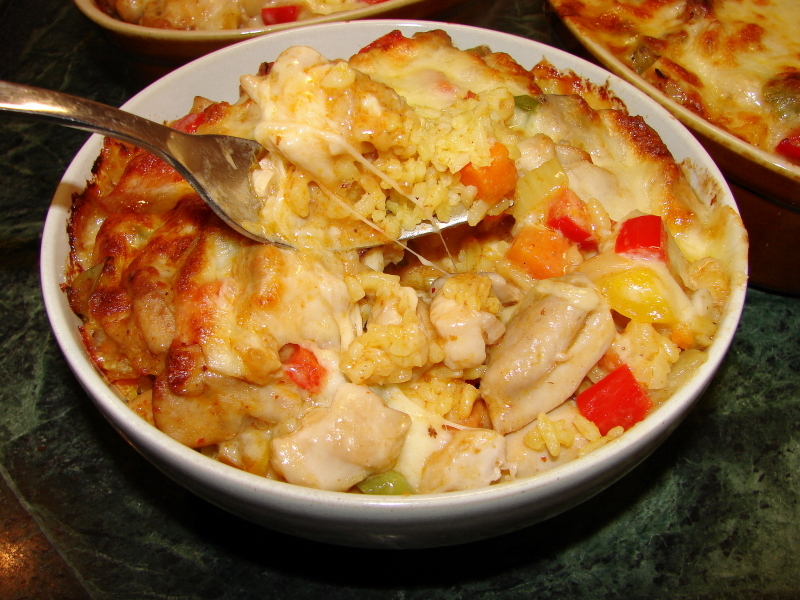 It's curried rice topped with a saucy chicken curry and cheese. This fusion (or bastardised if you prefer) curry chicken rice bake can be found in Hong Kong/ Macau cafe style restaurants 茶餐廳. I think Japanese also have similar recipe. Curry and cheese does not sound matching but this combination is really tasty. Once you have tried it you are likely to make this again. The rice can be replaced with macaroni it is equally yummy. Here is my way of making this oriental curry chicken rice bake. 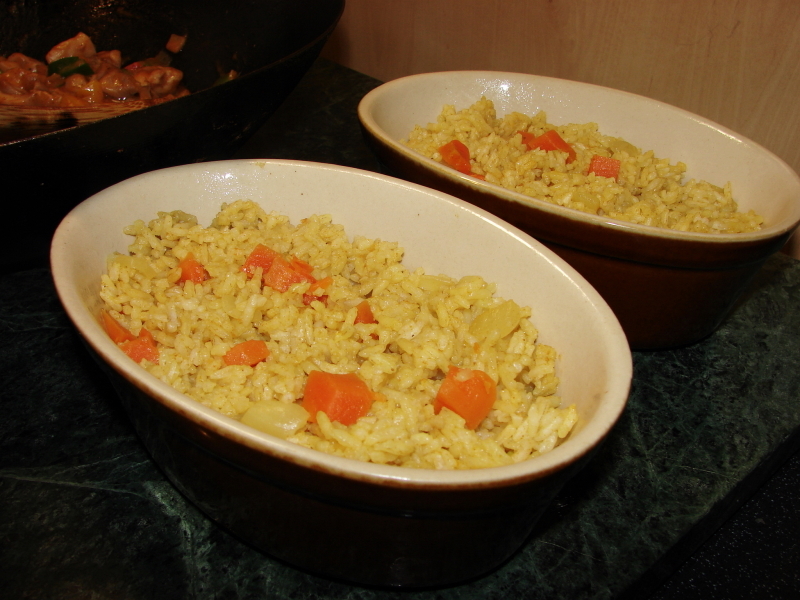 I had something similar in Hong Kong but a bit more greasy I am quite sure the rice was stir fried before baking. My version is still quite rich but not as greasy as restaurant style. sweet peppers (bell pepper), different colours. I used 1/2 of three different colours. 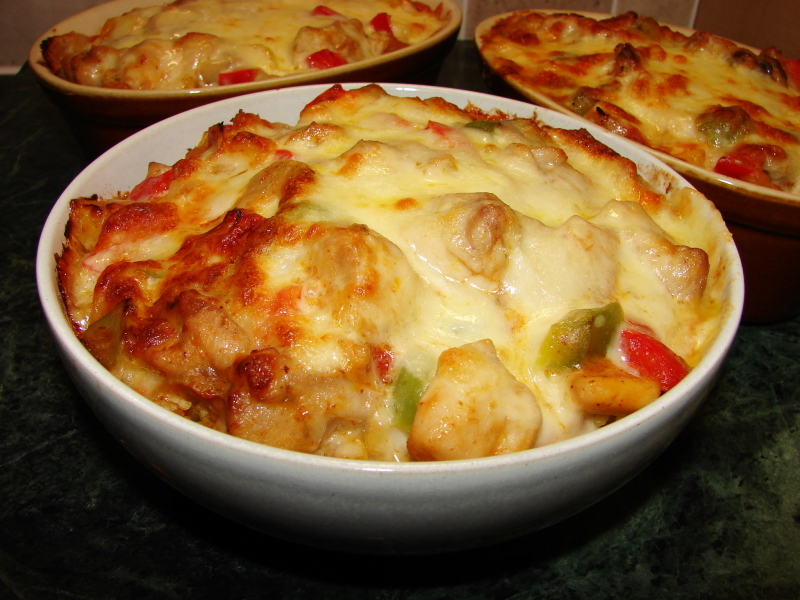 Cut chicken into bite size. Mix with salt and leave aside for 30 mins to 1 hr. Cut onion into small pieces. Dice carrot and sweet pepper. Put rice into a large sieve. Rinse and drain. In a pan or wok, add a little oil. Heat then add 1/2 the onion and carrot, stir fried till onion is soften. 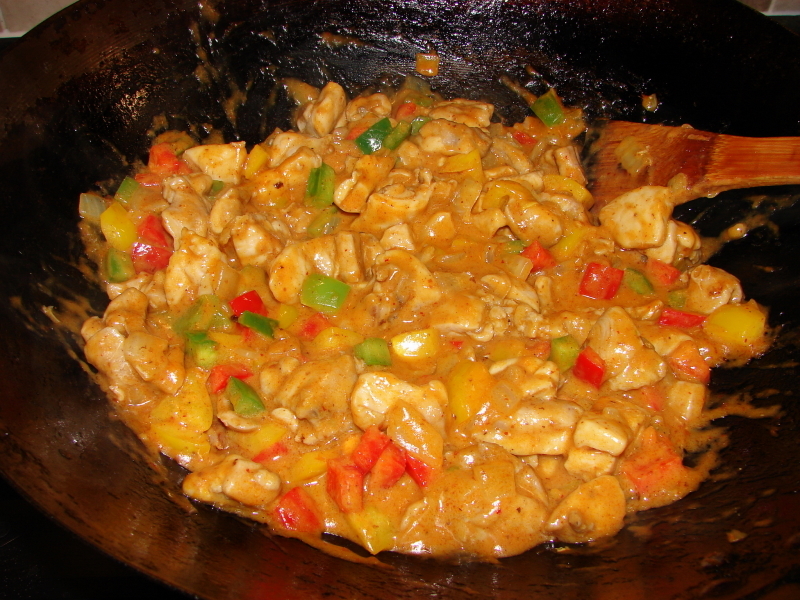 Add curry powder stir till fragrant. Add water, stir. Heat off. 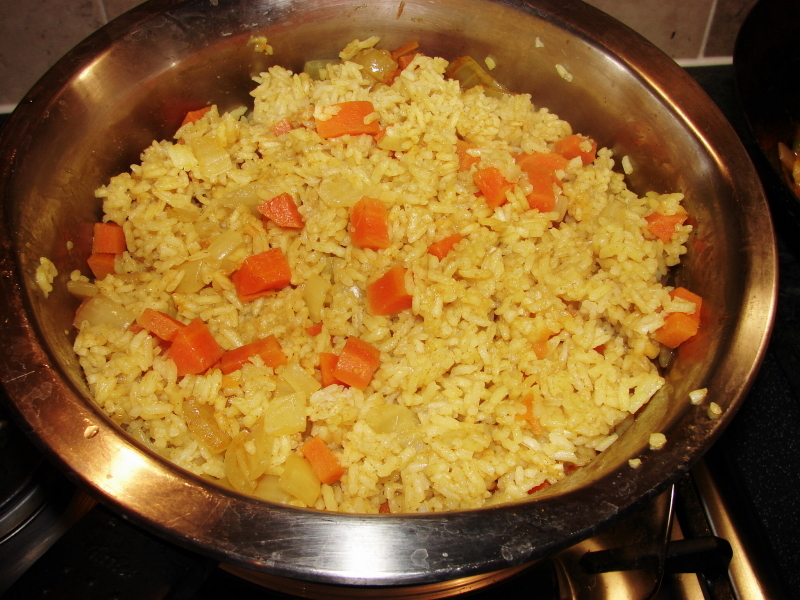 Add rice into a saucepan. Add cooked carrot, onion with the liquid. Add some chicken bullion powder and some salt to taste. Heat and cook rice. When water is boiling turn the heat to lowest and let it simmer with the lid on for about 15 minutes till water is completely absorbed and rice is cooked. Heat off and leave it covered and rest for another 10 - 15 minutes. In a wok or large pan, add few tbsp cooking oil. Heat till hot, add onion and stir till onion is softened. Add chicken, turn heat to high and fry chicken till browned. Add curry paste, stir till fragrant. Add sweet pepper and frozen peas. Add coconut milk and slackened cornflour. Cook till sauce is hot and thickened. Add some sugar and salt to taste. Loosen the rice. 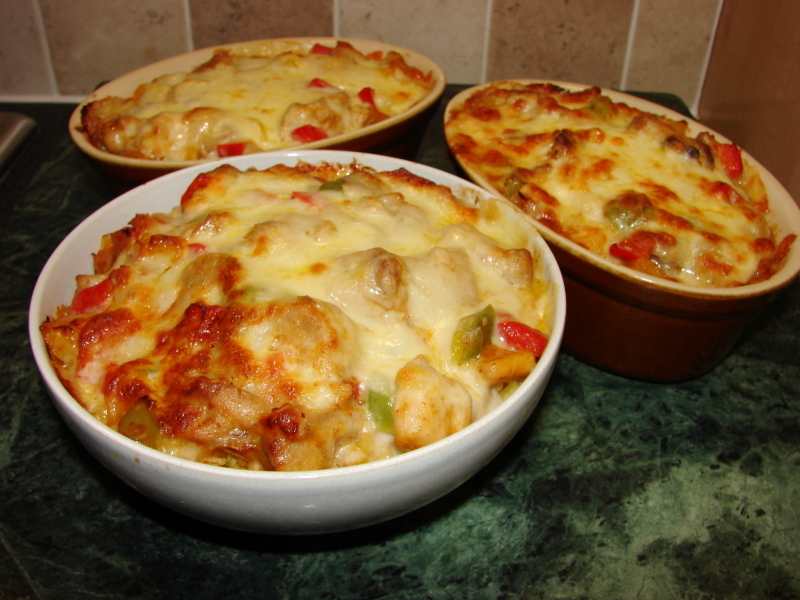 Put rice into oven proof dish in individual portions or spread this on a large baking dish. 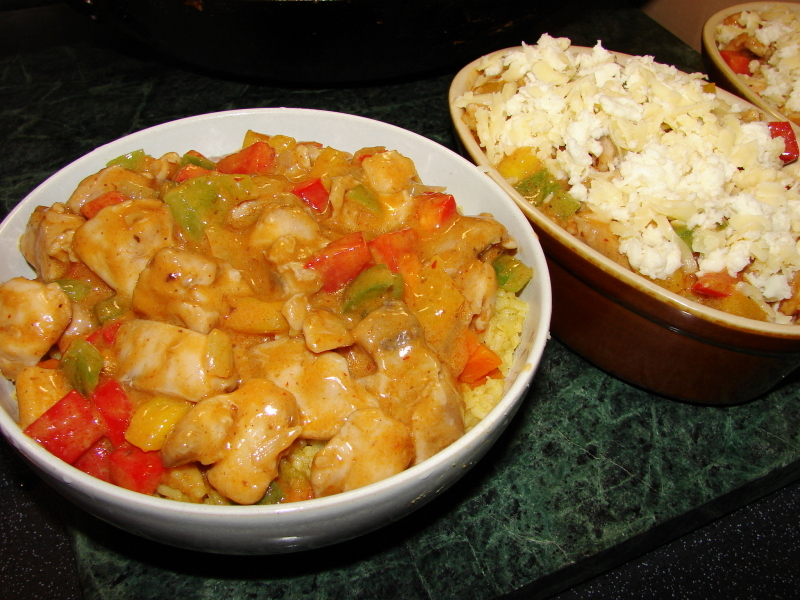 Add curry chicken on top of rice. Finally top with some mixed cheese. Bake at 200 deg C till golden for about 15 minutes. If making this rice in advance, can leave in the fridge for few hours up to 2 days. To bake chilled rice, use lower heat and bake much longer till heated through. Thanks for the recipe. I must try this. This is very tempting. Looks good for cold days like now. Thank you for sharing, Sunflower. Just made it. Mmmm good :) Used about a pound of mozzarella (ie 500gm). Wow that's a lot of stringy cheese, nice!